YEN.com.gh earlier reported on young female child who the MP said was part of the reasons why he was fighting for the development of Ghana and it seems we have come across another one of this reasons. We came across one of Kennedy Agyapong's daughters on photo-sharing social media platform, Instagram. The lady, named Amanda Agyapong, as we have learnt is currently pursuing higher education at the University of Pennyslyvania in the United States of America. 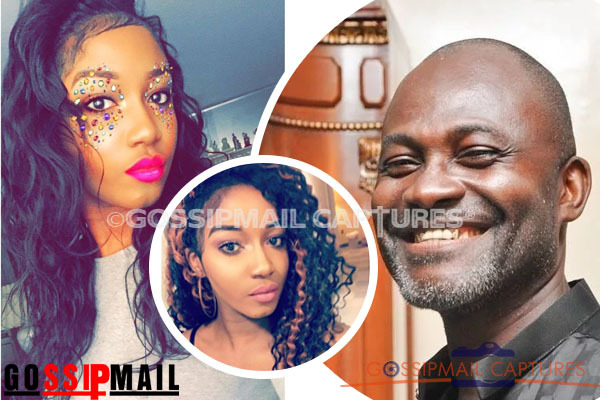 She has also posted a picture with the caption, "mi papi" together with her father, Kennedy Agyapong. From her social media accounts, she is studying Neuroscience, Marketing and Fine Arts and her feed is littered with post of her art. Amanda Agyapong seems to have an interest in media work as she also presents news on a local TV station. [next]As with the feed of any beautiful young lady, Amanda Agyapong's social media posts show off the multifaceted life she lives away from the media splash and attention that seems to follow her controversial father everywhere he goes.